What is the Xi'an Bell Tower? 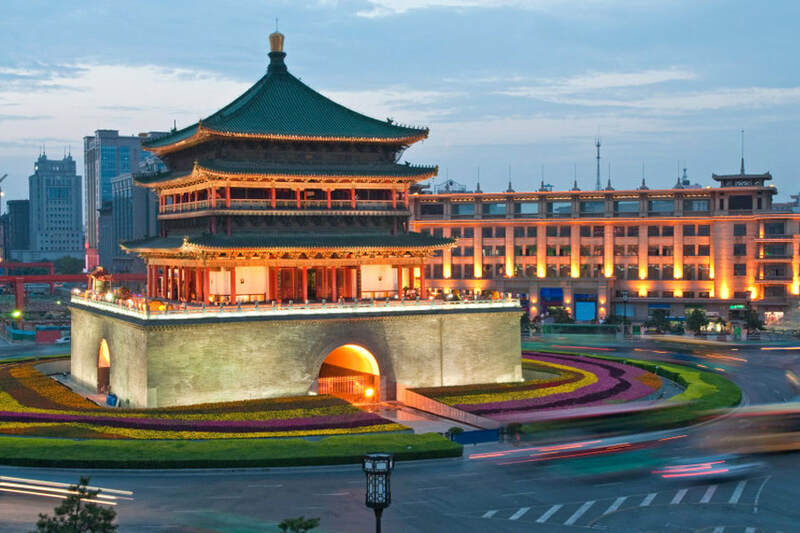 Originally built in 1384, the Xi’an Bell Tower is situated in the heart of Xi’an. It is one of the landmarks of the ancient city. Built on a square base built with blue brick and white ash, the bell tower is a brick and wood structure. The Xi’an Bell Tower is typical of the Ming Dynasty architectural style. The lower part is a square base with a masonry structure. The top is a four-sided structure covered with dark green glazed tiles. The tip of the top is plated with real gold platinum. The slightly sturdy eaves are covered with dark green glazed tiles, and the interior is decorated with gold paintings and painted beams. The big bell is hanged in the northwest corner outside of the tower is no longer functioning in timing, but it will still be ringing on the holidays and praying for peace. The carved inscriptions are in the west wall on the first floor. The door and window carvings of the Bell Tower are exquisite and complex, showing the decorative art which prevailed in the Ming Dynasty (1368 - 1644). There are 8 reliefs on each door leaf on each floor, and each relief reflects an ancient allusion. Visitors can also enjoy the chime-bells and drums ancient musical performance. Visitors can admire the old furniture made in the Ming (1368 - 1644) and Qing (1644 - 1912) Dynasties in the tower. The best time to visit the Xi’an Bell Tower is in the morning as it is not hot during its opening hours. The best months to visit are from March to May, and from September to October. The Xi’an Bell Tower is situated in downtown Xi’an. Therefore, there are some options. Rent a vehicle to the Xi’an Bell Tower. This is the quickest and most direct option. Take Bus 4, 6, 7, 8, 11, 12,15, 16, 26, 29, 35, 36, 37,43, 45, 46, 47, 201, 203, 208, 218, 235, 229, 300, 600, 606 603, 608, 609, 604, 611, 622, 616 and Tourist Bus 7 and 8 to the Stop of Bell Tower (钟楼). Take Metro Line 2 to the Stop of the Xi’an Bell Tower. As at 18th July 2018, the time for the chime-bells ancient musical performance is 09:30, 10:15, 11:00, 11:45, 14:00, 14:45, 15:30, 16:20. If you want to hail a taxi to the tower, some driver may refuse to take you there especially on holidays. Because the Xi’an Bell Tower is located in the heart of Xi’an, the traffic there is always busy. Interested in visiting the Xi'an Bell Tower on a Tour? Wendy Wei Tours offers a variety of different packaged tours as well as custom tours including the Xi'an Bell Tower, among other attractions and destinations. To find out more, please visit our Tours page or Contact Us directly to find out more.